The table above shows the issues currently available at Bioline International archive for this journal. The issues in bold are the most recent ones. 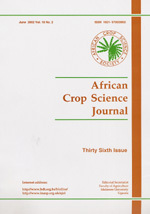 To retrieve the titles on each issue, click on the issue number.